He noted that three different state agencies have a role in regulation efforts. While the Bureau of Cannabis oversees commercial licenses, CalCannabis Cultivation Licensing monitors the state's track-and-trace system and issues licenses to cultivators, according to the state website. Manufactured Cannabis Safety Branch watches over commercial manufacturing and makes sure manufacturers adhere to cleanliness and labeling guidelines. "The overwhelming majority of the state has not developed responsible regulations that will allow the market to regulate itself. As a result you have a small percentage of the state providing regulated cannabis to a state that overwhelmingly supported legalization," Gudiño told Newsweek. "California is poised to be the largest marijuana market in the country, in the world." The report from Vessel Logistics, however, said that the state's industry had overestimated demand. Prior reports have also noted that the legal industry is not generating as much tax revenue as expected. 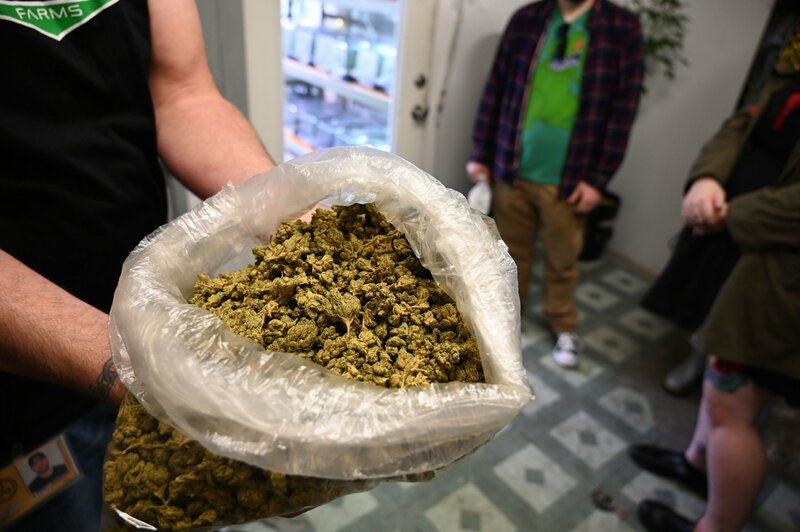 The New York Times noted that the state sold less legal cannabis in 2018 than the prior year, when it was not legal recreationally. Mason Tvert, Media Relations Director at Marijuana Policy Project and Morgan Fox, the Media Relations Director at the National Cannabis Industry Association, both said California could address the discrepancy by considering selling across state lines. "It could be worthwhile to start having that conversation and considering what steps California would need to take, as well as what changes might need to occur federally, for the state to begin establishing itself as a supplier for other states. Perhaps officials in California and Oregon could even band together to begin pushing for federal changes that allow for interstate commerce," Tvert said. "For decades, California has been supplying cannabis for other parts of the country through an illegal market. Rather than solely focusing on how to keep cannabis from illegally leaving the state, California officials may want to look into how it could start allowing it to leave the state legally." Fox said he didn't think growers would start distributing on the black market to compensate income. "I don't think we’re going to see a lot of people who have fought so hard to get licenses risk losing those licenses," he told Newsweek. The state's Bureau of Cannabis Control did not immediately respond when contacted by Newsweek. This article was updated to note that CalCannabis Cultivation Licensing issues licenses to commercial cultivators after the agency emailed Newsweek.